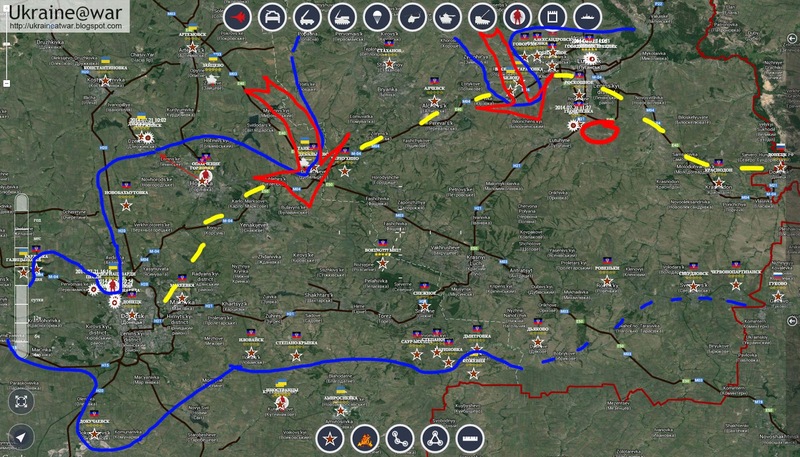 MilitaryMaps is a Russian Propaganda facebook application that tries to keeps track of Ukrainian units and only gives very limited information about Russian units. Yet their maps are sometimes useful. Ukraine has been trying to close the border with Russia, because Russia was bringing in massive amounts of armor, weapons and soldiers. See for instance this blog. This has only partly been succesful. In the most Eastern border crossing near Izvarino, the Ukrainians had not been able to close the gap. 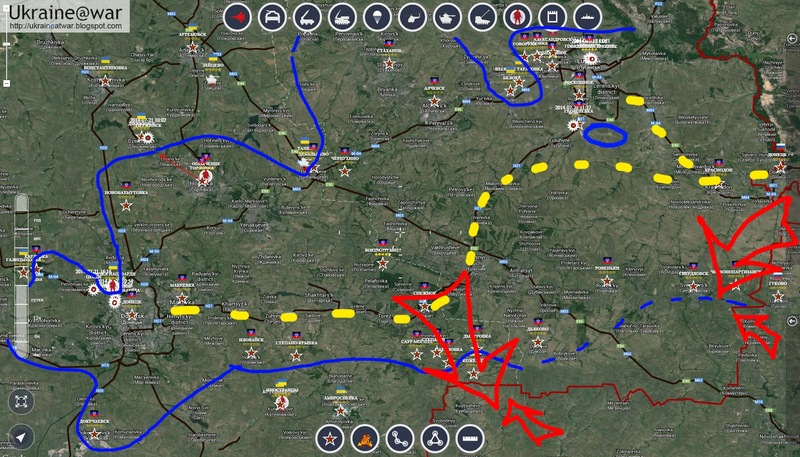 The two red arrows show that Ukraine is making a big move now to cut of this line supply line that runs towards the city of Donetsk (far South-West). The yellow dotted line shows the previous frontline and thus the area that has been freed now. Even though the cities are heavily damaged, the people can now rebuild them and restore there lives in freedom and without fighting. The dotted blue line is still in Russian terrorist control, but impossible for them to keep and soon Ukraine will free those areas as well. It is a matter of days. 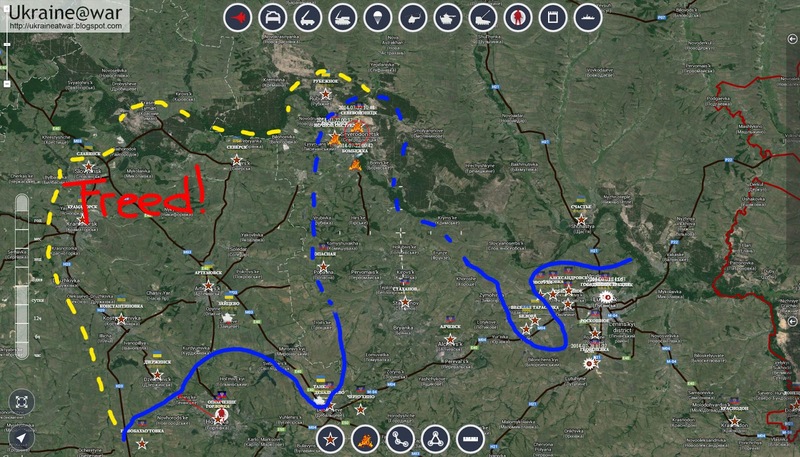 The middle red arrow shows how they try to cut of the Ukrainian forces that patrol the border and how they defend their current supply line. The red arrow in the East shows how Russia tries to push back the Ukrainian units that tried to close the border. Meanwhile the Russian commanders instruct (some of) their units to shell civilian areas with mortar and GRAD rockets to cause a lot of civilian casualties. They do this so the civilian population will not dare to rise against them, to blame this destrcution on Ukraine and to have an ongoing flow of horrible images that they can show on Russian tv to justify what they are doing and to recruit volunteers to fight and die in Ukraine. See this blog. Please support Ukraine to keep (the) Russia(n terrorists) out of their land. Rebels, pro-Russians or just Russians? What's happening with Graham Philips? Is battalion Vostok going to commit suicide? (pro)Russians force children to spy for them. (pro)Russians firing GRAD at a village? ATO making a lot of progress in Lugansk?